In the first sense referred to above, an amide is an amine where one of the nitrogen substituents is an acyl group; it is generally represented by the formula: R1(CO)NR2R3, where either or both R2 and R3 may be hydrogen. Specifically, an amide can also be regarded as a derivative of a carboxylic acid in which the hydroxyl group has been replaced by an amine or ammonia. Amide breakdown is possible via amide hydrolysis. Compared to amines, amides are very weak bases. 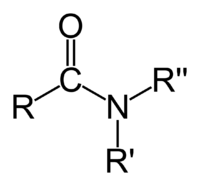 While the conjugate acid of an amine has a pKa of about 9.5, the conjugate acid of an amide has a pKa around -0.5. Therefore amides don't have as clearly noticeable acid-base properties in water. This lack of basicity is explained by the electron-withdrawing nature of the carbonyl group where the lone pair of electrons on the nitrogen is delocalized by resonance, thus forming a partial double bond with the carbonyl carbon and putting a negative charge on the oxygen. On the other hand, amides are much stronger bases than carboxylic acids, esters, aldehydes, and ketones (conjugated acid pKa between -6 and -10). 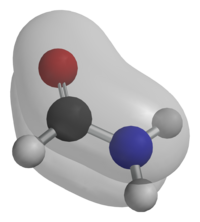 It is estimated in silico that acetamide is represented by resonance structure A for 62 percent and by B for 28 percent . Resonance is largely prevented in the very strained quinuclidone. While hydrogen bonding may enhance the water solubility of amides relative to hydrocarbons (alkanes, alkenes, alkynes and aromatic compounds), amides typically are regarded as compounds with low water solubility. They are significantly less water soluble than comparable acids or alcohols due to: 1.) their non-ionic character 2.) the presence of nonpolar hydrocarbon functionality, and 3.) the inability of tertiary amides to donate hydrogen bonds to water (they can only be H-bond acceptors). Thus amides have water solubilities roughly comparable to esters. Typically amides are less soluble than comparable amines and carboxylic acids since these compounds can both donate and accept hydrogen bonds, and can ionize at appropriate pHs to further enhance solubility. ↑ "Bodroux reaction at the Institute of Chemistry," (Skopje, Macedonia) LinkRetrieved November 8, 2007. Amides IUPAC Compendium of Chemical Terminology - the Gold Book.